Dr Andrew Stephenson is a Brisbane-based science communicator who has spent much of his career finding ways to spark more interest and engagement with science. 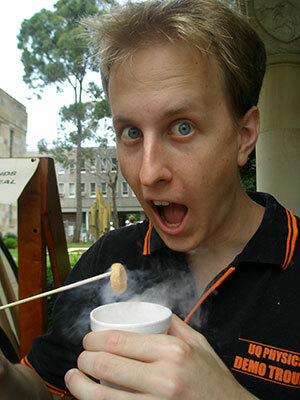 In addition to creating science-based public events and helping produce science-related television, he has personally performed science demonstration shows and workshops for over ten thousand school students all over Queensland and the Northern Territory. Andrew’s new public event series, The Science Nation, promises to provide educational entertainment that makes you laugh while you learn. This ambitious project marks a new challenge for Andrew whose active participation in science outreach goes back to the very early days of being a student in astrophysics and later, making superconducting plastics for his PhD at The University of Queensland. In recent years Andrew has worked on several television shows, including Wild But True, Lab Rats Challenge and The Shak. He was named Queensland Science Champion by the Queensland Government in 2014 in recognition for outstanding achievement in leadership in science communication through delivery of science outreach programs across Queensland. From 2009 to 2014, Andrew organised a public lecture series in Brisbane, which included some larger special events that had a bit more of an entertainment factor than the regular public lectures. “After seeing the strong interest in bigger events, I decided to create my own public events series that could tour nationally and this is how The Science Nation was born,” he explained. Andrew said that The Science Nation promises to provide educational entertainment that makes you laugh while you learn. Its first event, The Storytelling of Science, will tour through Brisbane, Sydney and Adelaide in May. “Whether it is Archimedes taking a bath or an apple falling on Newton’s head, stories are far more engaging and easier to remember than the facts science has to offer,” Andrew added. Palaeontologist, evolutionary biologist and archaeological scientist Dr Darren Curnoe. The Storytelling of Science is presented by The Science Nation. Where: Sydney Powerhouse Museum, Ultimo, Sydney. Refreshments: There will be an intermission where afternoon tea will be served.